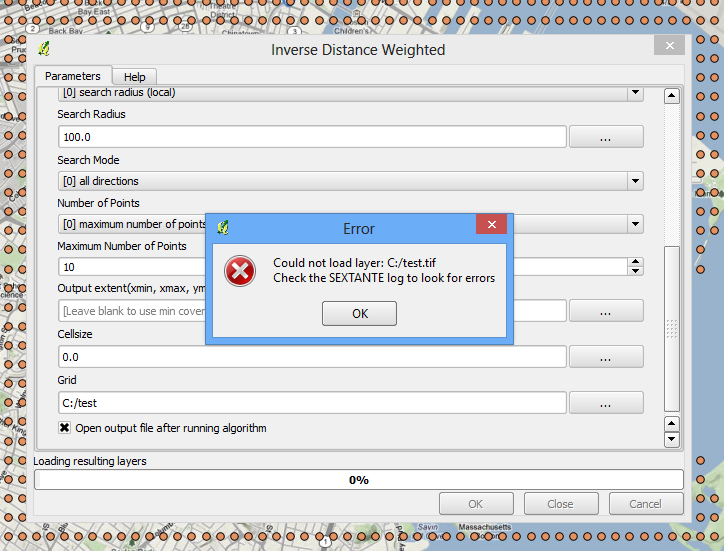 Using QGIS 1.8.0 and SAGA When trying to use the IDW function from SEXTANTE SAGA 2.1.0 64-bit, I get the following error: Could not load layer: C:/test.tif. This error seems mysterious to me, any ideas? I am using QGIS 1.8.0 with SAGA 2.1 b3 64-bit on Windows 8 64-bit. Updated to QGIS v.1.9.90. When activating SAGA under SEXTANTE, I get the following error. I get the same error when I choose any of SAGA's function under SEXTANTE's toolbox. C:\>saga_cmd grid_gridding "Inverse Distance Weighted" -SHAPES "C:/Users/0_o/Desktop/mytest/Scores/MA Full test/MA Scores.shp" -FIELD "score" -TARGET 0 -WEIGHTING 0 -POWER 2 -BANDWIDTH 1 -RANGE 0 -RADIUS 100 -MODE 0 -POINTS 0 -NPOINTS 10 -USER_XMIN 2135113.26163 -USER_XMAX 2341329.19555 -USER_YMIN 88475.4178879 -USER_YMAX 185492.363448 -USER_SIZE 80 -USER_GRID "C:\Users\0_o\AppData\Local\Temp\sextante\MA IDW.tif.sgrd"
C:\>saga_cmd io_gdal 1 -GRIDS "C:\Users\0_o\AppData\Local\Temp\sextante\MA IDW.tif.sgrd" -FORMAT 1 -TYPE 0 -FILE "C:/Users/0_o/Desktop/mytest/Scores/MA Full test/MA IDW.tif"
error: Grid file could not be opened. 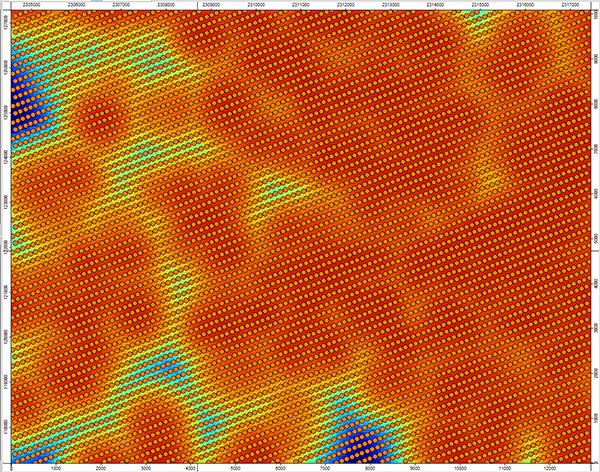 grid_gridding "Inverse Distance Weighted" -SHAPES "C:/Users/0_o/Desktop/mytest/Scores/MA Full test/MA Scores.shp" -FIELD "score" -TARGET 0 -WEIGHTING 0 -POWER 2 -BANDWIDTH 1 -RANGE 0 -RADIUS 100 -MODE 0 -POINTS 0 -NPOINTS 10 -USER_XMIN 2135113.26163 -USER_XMAX 2341329.19555 -USER_YMIN 88475.4178879 -USER_YMAX 185492.363448 -USER_SIZE 80 -USER_GRID "C:\Users\0_o\AppData\Local\Temp\sextante\MA IDW.tif.sgrd"
io_gdal 1 -GRIDS "C:\Users\0_o\AppData\Local\Temp\sextante\MA IDW.tif.sgrd" -FORMAT 1 -TYPE 0 -FILE "C:/Users/0_o/Desktop/mytest/Scores/MA Full test/MA IDW.tif"
first, i recommend to you use the latest QGIS master with the latest SEXTANTE. Not the answer you're looking for? Browse other questions tagged qgis qgis-processing saga or ask your own question.